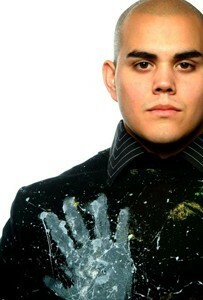 Born in Los Angeles in 1982, David Garibaldi began creating at a young age, though not always with the best intentions. When he was young, Garibaldi participated in a life of vandalism through graffiti; however, near the end of his high school career, Garibaldi decided to turn hip hop culture into a positive influence. In 2003, Garibaldi began putting his creations on paper and canvas, and he would paint live at jazz sessions and nightclubs. Though his work was always directly influenced by music, when he saw the paintings of Denny Dent, the “Rock and Roll Painter,” he was inspired to create a live stage show called “Rhythm and Hue” in which he would paint six foot portraits of pop icons to music. In a matter of minutes, the seemingly random shapes and colors come together to form images of his subjects. In conjunction with the work he creates in his studio, “Rhythm and Hue” has brought Garibaldi success and renown.